Knit slippers are great all year long, and this fun design is a no-sew version of a shape that’s popular in Finland. Anja, the designer, told me these slippers are usually made by knitting a bunch of squares and sewing them together into the slipper shape. She wanted to see if she could make them by picking up stitches along the sides of the squares to make a no-sew version. She finished the project with a three-needle bind off, so the only finishing needed is to weave in ends. 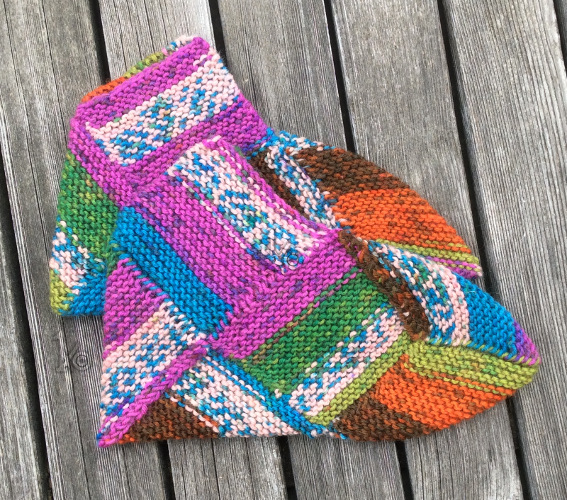 She calls it the K method, and you can get all the details and the free pattern on Ravelry.